Hanoi (VNA) – The Mekong Delta should promptly increase connectivity among its localities to create policies and mechanisms in order to ensure national food security, said Tran Huu Hiep, head of the Southwestern Steering Committee’s Economic Division. 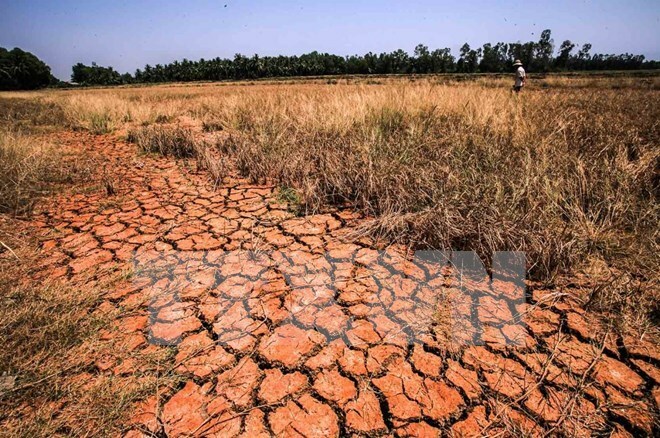 Hiep made the recommendations in the context that the Mekong Delta - the country’s rice bowl, is grappling with severe drought and salinisation as impacts of the El Nino, thus affecting regional economic development and daily lives of local people. According to the official, the Mekong Delta is one of the world’s three deltas hardest hit by climate change, rising sea level. The Ministry of Natural Resources and Environment forecast said about 40 percent of the region will be submerged if the sea level rises by 1m by 2100 without effective countermeasures. To cope with the problem, regional provinces have set forth both short and long-terms measures which focus on adjusting cultivation schedule and transforming the structure of plants and livestock. However, the localities are incapable of seeking the market for their products and linking irrigation facilities and transport infrastructure in the region. In the long run, he suggested reviewing plans for production, irrigation and water supply drawn up by the provinces to ensure regional connectivity in these areas, and further in the struggle against climate change.